To find your bonus heads, just login to your Member Account and click Patch/Bonus for CrazyTalk 8. Hi Peter... 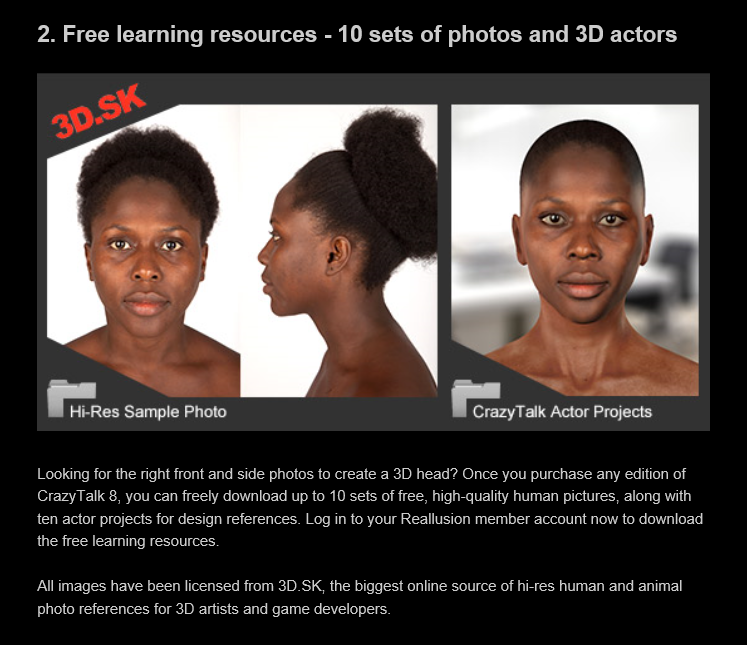 I just purchased CrazyTalk 8 for Mac and downloaded all the files offered on my account/membership page including this Bonus Pack with 10 Quality Heads. While all the other files downloaded as installers, this file, original name, CrazyTalk8_Bonus_10Heads_for810.zip -- unzipped as a folder without an installer – folder name: CrazyTalk 8 - Bonus pack_10 Heads. Inside the folder are a Read Me text file, and two folders: CrazyTalk 8 Template, and Resource Photos. The Resource Photo folder's contents are straightforward. The CrazyTalk 8 Template folder however, contains several other folders with file path Actor/3D Actor/Resource_ctimodels. For Mac, these files would likely be placed somewhere in the User/Library... perhaps in Application Support or some similar location, but the Read Me file only provides instructions for what appears to be a Windows-based system. Where are Mac users supposed to place the CrazyTalk 8 Template folder (or perhaps just one of its subfolders) to function correctly with CrazyTalk 8? Is it enough to just install this folder? Does the Resource Photo folder also have to be placed in a particular location?... or can it just be archived anywhere for future use... importing the heads on an individual basis. Thanks!